Black Ice Software - BiBatchConverter version 4.31 is released! BiBatchConverter version 4.31 is released! With improvements to the BiCommandLineConverter, stability improvements for Content Based email sending, and improved Filename Generation. Black Ice Software has released version 4.31 of the BiBatchConverter. This version includes an improved BiCommandLineConverter to enhance the user's experience with a new command to list the available parameters in the command line. The new BiCommandLineConverter also includes stability improvements for merging documents and for detecting the available printers in the command line. The new BiBatchConverter includes a new feature for the filename generation option to use the Document Name with the Output Directory from an INI file. This new feature helps Administrators and System Integrators to change the Document Name and Output Directory dynamically without changing the Printer Driver settings. 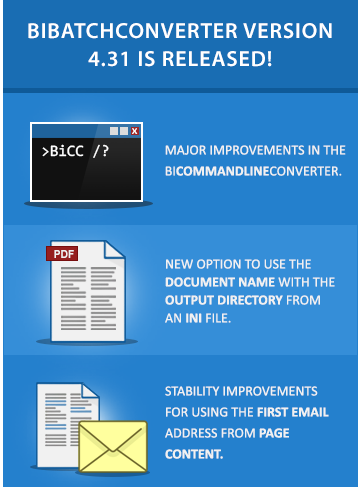 Version 4.31 of the BiBatchConverter also includes stability improvements for Use first email address from page content feature when printing certain PDF documents. Added filename generation option: "Use the Document Name with the Output Directory from an INI file"